Jeju Olle Trail is a long-distance foot path on Jeju Island, an island off the south-west coast of South Korea. 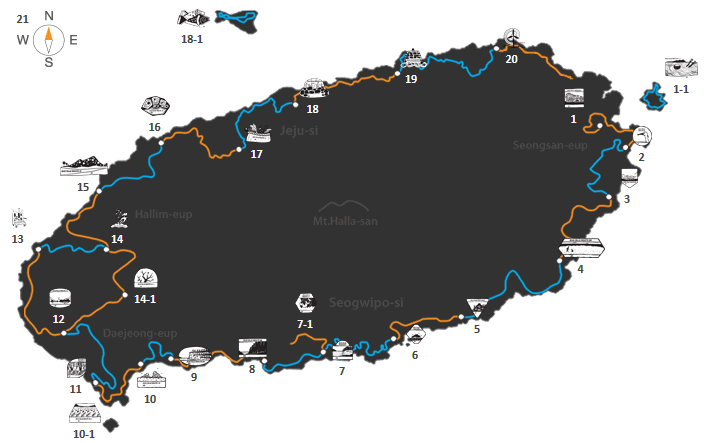 The overall route, mostly following the coastline, consists of 21 connected numbered main routes, 5 sub-routes, and a short spur that connects to Jeju International Airport. The routes have an average length of 16 km and all together total 422 km. The exact length and locations change over time as trails are modified or re-routed. The routes pass through various landscapes along the way including small villages, beaches, farms, and forests. Many routes encompass some of the island's 368 oreums, which are low parasitic volcanoes and historical sites dating from ancient times through to the modern era. Since its founding in 2007, it has become a major draw for Jeju Island, which attracts not only visitors from mainland South Korea, but also foreigners who have a taste for hiking. According to a 2008 statistic, over 1.2 million people visited and brought $25 billion in economic benefits to South Korea.